I like small wins. 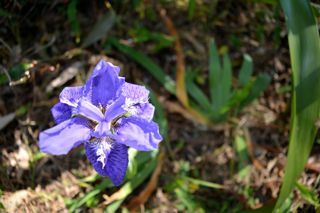 Here, my blue iris bloomed for the first time in almost a year. Perhaps it was because I moved her from the edge of a small pond to the shade of a gum tree – I’m not sure what happened to her, but she came back. That makes me happy. I appreciate ALL readers and visitors and look forward to your continued support. Thank you! That’s wonderful, Joycelin! Congratulations. You deserve it. And your Iris is gorgeous. Thank you! The Iris is for you too Sue. How are you? Am about to shut my eyes for the night. Warm wishes to you. For all you wonderful bloggers who appreciate small wins… Welcome to Kev’s Rollover Sunday, TM! 8-hours? what is that? 😀 One day I will Millie. Thank you. Hey Nomzi! – It is lovely to see you and thank you very much. Enjoy your weekend too.